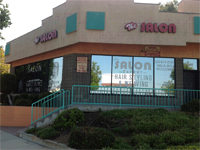 The Salon is an upscale beauty salon that blends artistry with a commitment to professionalism. From the teamwork of the stylish staff, to the comforts of The Salon itself, every detail culminates to meet and exceed every client's expectations. Our multicultural styles suit your every need. Specializing in a variety of healthy hair designs, including cuts, relaxers, perms, weaves, wigs, color, thermo work, up-do's, texturizers, natural styles, hair removal, and make-up. Metro Discount: Mention "Metro," or "Crenshaw Project," or bring a printout of this page to receive The Salon New Client Special: 20% off new services. *Does not apply to existing clients or to product sales. By appointment only. Go Metro: The Salon is located at 430 E. Florence Av. Find your best route with the Trip Planner. More Info: For information email thesalon430@aol.com or call 310.674.2192.